Scale is a word which underlies much of architectural and urban design practice, its history and theory, and its technology. Its connotations have traditionally been linked with the humanities, in the sense of relating to human societies and to human form. To build in scale goes virtually without saying in the world of ‘polite’ architecture, but this is a precept observed more often in the breach when it comes to vast swathes of commercial and institutional design. The older, more particular, meaning in the humanities, pertaining to classical western culture, is where the sense of scale often resides in cultural production. Scale may be traced back, ultimately, to the discovery of musical harmonies, or it may reside in the arithmetic proportional relationship of the building to its parts. One might question the continued relevance of this understanding of scale in the global world of today. What, in other words, is culturally specific about scale? And what does scale mean in a world where an intuitive, visual understanding is often undermined or superseded by other senses, or by hyper-reality? Papers are invited from architects, urban designers, artists, landscape designers and other thinkers and makers who look at scale in its various manifestations. 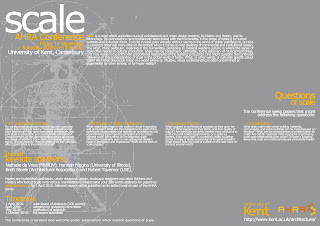 Please send your 300 words abstracts for papers to: scale@kent.ac.uk by 1 April 2010. Selected papers will be published as an edited book as part of the AHRA series. The conference organisers also welcome poster submissions which explore questions of scale.